Artist's conception of the proposed Advanced Telescope for High-Energy Astrophysics (Athena+). There's a big expiration date looming ahead in astrophysicist Kirpal Nandra's mind. 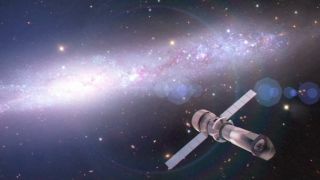 The current X-ray space telescopes in orbit will likely be at or near the end of their lifetimes by about 2020, so plans are underway to develop a successor to keep watch on deep space. With NASA's budget in flux, Nandra — who is with the Max Planck Institute for Extraterrestrial Physics — said Europe needs to act quickly and independently to cover the expected gap in X-ray astronomy. Athena+, though a strong candidate, faces some tough competition, Nandra told SPACE.com. Since X-rays are only visible from space, this is the last chance to put something up there within the next couple of decades. "If Athena doesn't go forward, we won't have any X-ray eyes out there looking at the hot parts of the universe, or the energetic parts of the universe, in the 2020s," Nandra said. Previously, Nandra's team came very close to an X-ray telescope concept, only to see it yanked away. The International X-ray Observatory was backed by ESA, NASA and the Japan Aerospace Exploration Agency before it was terminated in 2010. Budgetary problems within NASA caused it to pull back on IXO, Nandra said. By contrast, Athena+ is solely European-funded and based partly on the XMM-Newton telescope in orbit right now. But there are big differences. The design calls for silicon plates to reduce the weight of the telescope while making it bigger — allowing an Ariane 5 rocket (the biggest booster the Europeans have) to heft the 12-meter (39.4 feet) machine into orbit. On board will be a new kind of detector — the X-Ray Integral Field Unit — that can detect a minute change in heat when a single X-ray photon is absorbed. Athena+ will also carry a wide-field imager (WFI), which can survey vast swatches of the universe at high sensitivity, but which is not limited to a narrow field of view. "That combination is exactly what you need if you want to discover black holes growing in the deep universe, the earliest supermassive black holes," Nandra said, adding that another science goal is to understand how gas structures in the universe formed and evolved. With Athena+, researchers hope to learn how these giant black holes — which form in galaxies — affect the rest of the universe. They're plenty powerful: Nandra said scientists have seen these effects in collections of thousands of galaxies. In these clusters, the energy output of the black hole at the center can be seen bubbling and stirring up gas millions of light-years away. The presence of a black hole can also stop star formation inside of a galaxy as it blows out the gas, Nandra said. "It turns an active star-forming galaxy into a passive galaxy, a process that we call cosmic feedback, and that's one of the things that we're trying to work out — how that process happens — with Athena." Athena+ is expected to cost 1.2 billion to 1.3 billion euros ($1.6 billion to $1.8 billion), including launch costs. If it passes the competition, Athena+ will still need to meet several key design and construction milestones before launch. ESA has accepted dozens of white papers for two launch opportunities in 2028 and 2034. Mission concepts include a planetary science infrared observatory, a mission to study Neptune and Triton, and an orbiter and lake probe for Saturn's moon Titan.